On the 9th of April 1880, the Czech architect Jan Letzel was born in the town of Náchod, Bohemia. After succeeding as a prolific architect in Bohemia, Dalmatia, Montenegro, Herzegovina, and Cairo, in 1907, he moved to live and work in Japan, where together with his friend, Karl Hora, he established his own Tokyo-based architectural firm. Within few years he designed about forty buildings for public use. However, his most significant design was the huge 1915 building designated initially for the Hiroshima Prefectural Commercial Exhibition (HMI). In 1921 the name of the building was changed to the Hiroshima Prefectural Products Exhibition Hall, and in 1933, to the Hiroshima Prefectural Industrial Promotion Hall. However, its final name, and the function it eventually came to fulfil, could not have been anticipated by its creator and architect. 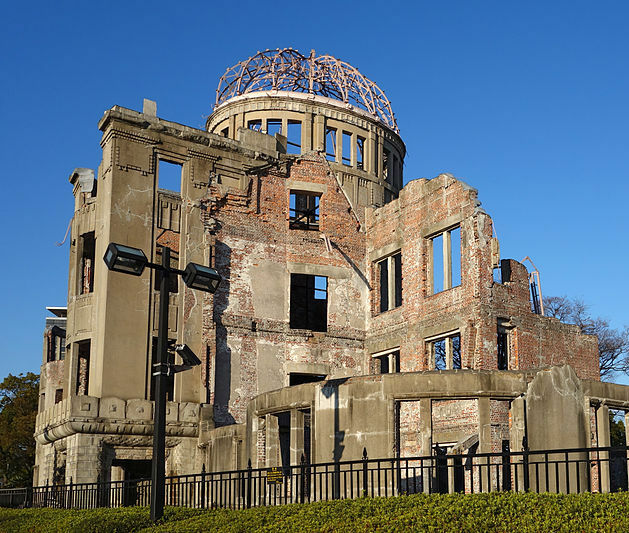 Nowadays, the building, or at least what is left of it, serves as the Hiroshima Peace Memorial, commemorating the atomic bombing of Hiroshima on the 6th of August 1945. Interchangeably called the Genbaku (A-Bomb) Dome, the building stood right in the heart of the explosion. The building’s solid construction, secured by vertical columns, was able to resist the nearly vertical downward force of the blast. The bomb, originally intended to hit the Aioi Bridge, missed its final destination and exploded directly over the Shima Clinic, only a few hundred meters from the Dome. As a result of this hardly fortunate mistake, the building was the only structure left standing near the bomb’s hypocentre, with some of its walls still intact. Unfortunately, all of the people inside the building were killed instantly. For a long time after the bombing, the building stood abandoned, undergoing the process of even further deterioration. The silent witness of the horrific tragedy, it had to wait until 1966, when the Hiroshima City Council decided for its preservation. However, the plans were initially met with major opposition, as some of the survivors of the bombing opted for the building to be torn down. With the memories deeply engraved in their psyche, they saw the building as a painful reminder of those events. The atomic bombing of Hiroshima was after all unlike any other disaster experienced in the world’s history. “One-third of those within 2 kilometers of the hypocenter left someone behind… The breakdown was so complete there was none of the post-disaster euphoria that is sometimes seen after massive disasters – the “at least I’m alive” attitude… Instead, there was a generalized psychic numbing.” (Joanne Silberner, Psychological A-Bomb Wounds, Science News, Vol. 120, No. 19, Nov. 7, 1981). The enormity of this psychological numbing can be measured by the time that had to pass before the Japanese nation was able to start incorporating the memory of the Hiroshima bombing as the element of their national identity. In fact, “…”Hiroshima” was once almost forgotten in the aftermath of World War II. The Japanese were able to commemorate “Hiroshima” as national trauma only after one Japanese fishing boat was struck by the fallout of the hydrogen bomb near Bikini Atoll in March 1954.” (Hiro Saito, Reiterated Commemoration: Hiroshima as National Trauma, Sociological Theory, Vol. 24, No. 4, Dec., 2006). One of the reasons for this void in national memory was the fact that the huge scale of the disaster was defined mostly on global rather than local terms. For example, “those who died of the atom bomb were identified not so much as Japanese as citizens of Hiroshima who were considered members of humanity; at this point, association of “Hiroshima” with a particular nation was virtually nonexistent. … In other words, although the city of Hiroshima was physically located in Japan, the city and its experience of the atom bomb were presented as transnational and beyond territorialisation by the Japanese nation-state.” (Saito). This way the Hiroshima disaster was simply denationalised and consequently the atom bomb was too. The atom bomb “… was conceived as an “actor” in its own right… When Mayor Hamai discussed the devastation of the city at the Peace Memorial Ceremony, he talked as if the atom bomb had fallen independently of Japanese and American military operations. He almost always used passive voice sentences, such as “our Hiroshima was devastated in an instance by the first-ever atom bomb”… without reference to nationalities, so as to blur the geopolitical origin of the bombing.” (Saito). The ‘nationalisation’ process of the memory of the Hiroshima bombing was slow and timid at first. In 1951, at the end of the Occupation, some articles constructing the image of ‘A-bomb orphans’ or ‘A-bomb survivors’ started to emerge. Some survivors were also trying to reveal their experiences to the public by writing and publishing memoirs. However, after the disaster most of them were left with very little to live on, and so their preoccupation with rehabilitating national memory was not among their priorities. The breakthrough came after the aforementioned accident near Bikini Atoll, where the crew of the Japanese tuna boat had been exposed to major radiation. “While all the crew … were being hospitalized for several months, their conditions were reported methodically as if their suffering were representative of the entire Japanese nation. When one of the crew, Aikichi Kuboyama, died in September 1954, it was declared that radioactivity “killed” him. His death made national news headlines, and delegations of the Japanese government attended his funeral. Although it is not known whether Kuboyama’s death was caused by radioactivity or by complications of medical treatment, the point is that it was imagined that the H-bomb fallout “killed” him. … Imagination now gave a coherent shape to the national identity: the Japanese were victims of nuclear weapons.” (Saito). The understanding of the reasons behind such a slow pace of restoration of the Japanese national memory helps to imagine the Genbaku Dome as a physical incarnation of this process. First crushed and forgotten like the victims of the atom bombing, it was eventually rehabilitated and brought to the centre of public attention. Although badly ruined, its rather skeletal construction stands firm in the middle of the Hiroshima Peace Memorial Park to remind not only of the global aspect of atomic attacks but most of all of the wounds inflicted on the Japanese nation.